Minnesota won nine games, plays in a nice stadium with new facilities on the way. So the Gophers can legitimately take a step forward into greater prominence with the right hire. There’s no clear-cut answer as to who will be the starting quarterback for the Gophers football team next season. Recruiting is a giant question mark after a January coaching change. And we still don’t know the entire fallout from the various entanglements related to the alleged sexual assault (and administrative response) that dominated discussion this past season. All that said: a case could be made that the next head coach — P.J. Fleck? Someone else? — will inherit the best Gophers football job in 75 years. 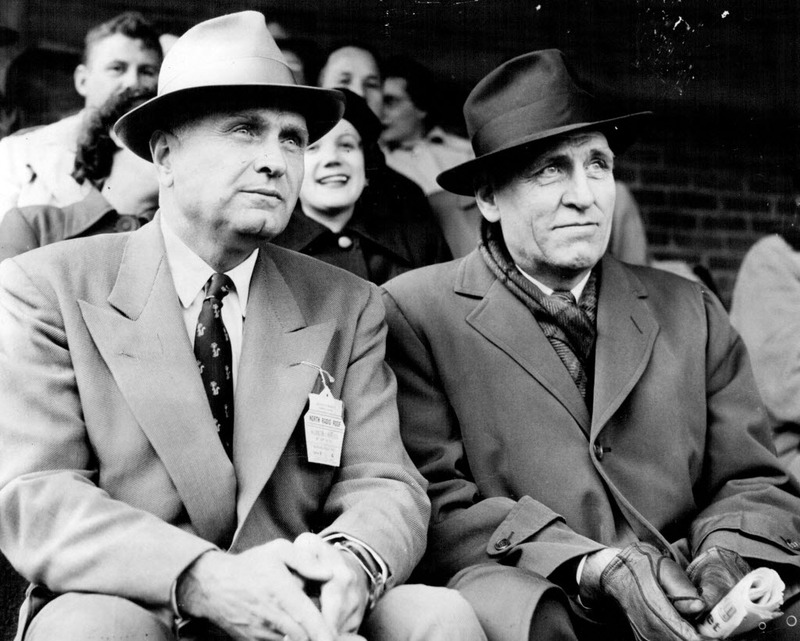 Back in 1942, Dr. George Hauser took over for Bernie Bierman after an 8-0 season that ended with the Gophers being named Associated Press national champs. That’s a pretty good gig. 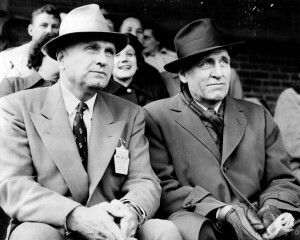 (Bierman is pictured on the left, Hauser on the right). Hauser went 15-11-1 over the next three years before Bierman returned. Bernie’s second stint from 1945-1950 was still pretty good, but his final year was a 1-7-1 campaign in which the Gophers were shut out four times. Wes Fesler took over for three unremarkable seasons before Murray Warmath revitalized the program — with a peak of back-to-back Rose Bowl appearances in 1960 and 1961. But Warmath’s final three seasons from 1969-71 were all losing years, leaving new coach Cal Stoll with a rebuilding project in 1972. He did fine in his seven seasons (39-39 record), but Joe Salem hardly inherited a juggernaut in 1979. Salem’s final season was the inglorious 1983 campaign in which the Gophers went 1-10 and lost 84-13 to Nebraska. In came Lou Holtz, who is remembered as a savior. In his two years here, he definitely put the program on the upswing, but Minnesota’s record was merely a combined 11-12. If he had lasted a few more years in Minnesota, the revival might have been permanent. Instead, John Gutekunst inherited an improving team that had yet to fully turn a corner. He went 29-36-2 (including 2-9 in his final season in 1991) before Jim Wacker took his shot. Wacker was an immensely nice and positive man, but his best record in five seasons was 4-7. That was the mess Glen Mason inherited, and Mase is correctly remembered for bringing respectability back to the program. Mason’s era peaked in 2003 with a 10-3 season (5-3 in the Big Ten). His final three years were decent, but from 2004-06 the Gophers were 10-14 in the Big Ten. It felt like the program had reached a certain middle-of-the-pack equilibrium. Tim Brewster certainly inherited a team that should have been better than 1-11 in his first season (2007), but that bottoming out indicates there was work to do. By 2010, Brewster was fired and Jerry Kill was left in 2011 to clean up the mess. He did his best before health forced him out, and his former defensive coordinator Tracy Claeys helped guide the 2016 team to a 9-4 finish and a strong bowl win over Washington State. The convergence of a new AD in Mark Coyle and the aforementioned off-field problems led to Claeys’ demise, leading the Gophers into rare territory: being able to hire a coach from a position of program strength. The Gophers have been in the Big Ten title discussion three of the past four seasons and are coming off a year in which they won nine games — most in the Kill/Claeys era and most overall since 2003. Yeah, the schedule was forgiving but the Gophers have done far worse against easy slates. There will be players who transfer during the transition, but I’ll be shocked if it’s more than a handful. It’s not a program that feels stalled or stuck in the past. It’s a team playing in a nice stadium with new facilities on the way that can legitimately take a step forward into greater prominence with the right hire. And that new hire should look at this as a very attractive job. Outside view of the Gophers: Why do these things keep happening here? Poll: Who is your favorite choice to coach the Gophers?